Lubna Zahid is a classically trained fine artist who works in mixed media. 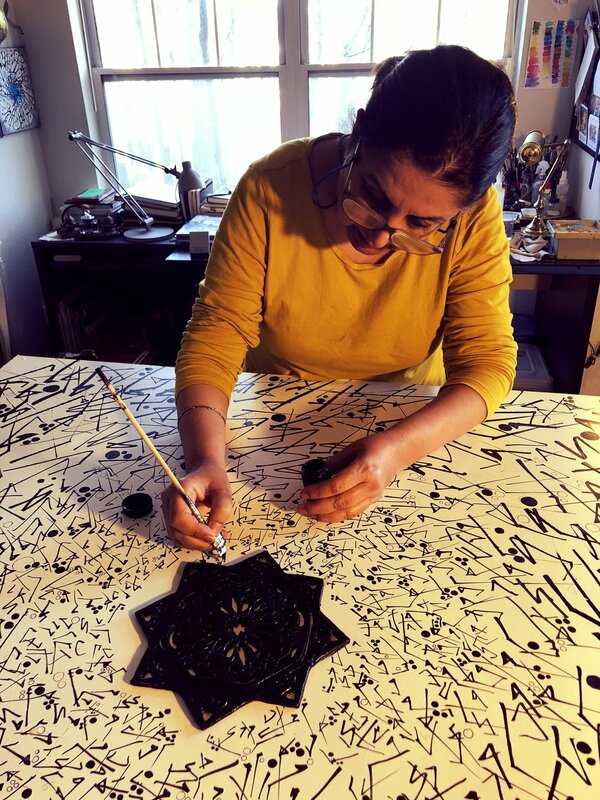 Strongly influenced by contemporary and classical calligraphy in Urdu, Arabic and Persian, her pieces include texts in these languages. She experiments with bold renditions of Islamic decorative forms such as the Shamsa. Her work is inflected deeply by the works of masters like Mansoor Rahi, Sadequain, Dulac, Klimt and Kahlo. Typographic elements in her works rely heavily on the progressive post-colonial movements in the Muslim world in the 20th century. The philosophical works of thinkers like Allama Iqbal and Faiz Ahmed Faiz shaped her generation and their ideas are evident in her pieces. Lubna has exhibited her work in the United States and in Pakistan. She teaches workshops and seminars on art and art history in various venues including the Smithsonian’s Freer and Sackler Galleries. She lives in the Metropolitan Washington, D.C. area. Lubna received calligraphy and illumination training by master calligrapher Abbas Baghdadi. She works with a variety of media including transparent watercolor, gouache, graphite, charcoal, ink, acrylics, gold leaf and clay. Her techniques include glazing, pouring, layering, splashing, spattering, textural writing and gilding.